Classroom management is an art, a symphonic composition of skills practiced, revised, and finely tuned to fit the needs of a particular group of kids, no matter what culture you happen to serve. Younger kids need more structure and leadership from the teacher, older kids need more responsibility and freedom. Quite simply, classroom management doesn't change if you teach underprivileged kids; the biggest difference is how much energy a teacher spends in developing a trust relationship with kids as well as meeting affective needs before academic needs. 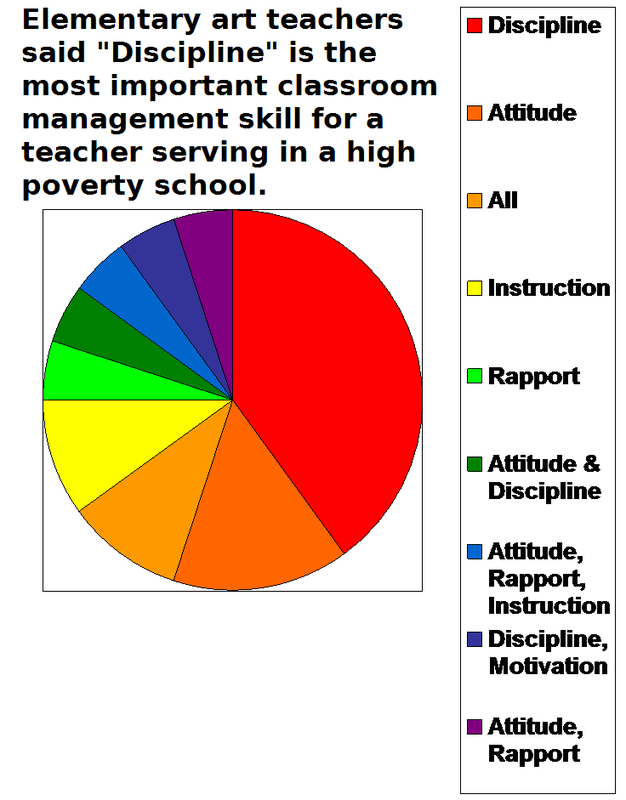 This final article in the "poverty" series is about specific strategies a teacher who serves large proportions of students in poverty can employ. I have included as many valid resources as I could find and will continue to add to the list. However, as a full time art teacher I know I have just had time to dip my little toe in the river of existing literature. So, if you are aware of any more valuable resources, please let me know! 1. My own attitude forms the foundation for everything that takes place in the classroom: I can take responsibility for being joyful (not complaining, ever) and for compassionately and consistently holding the kids accountable. Being proactive, not reactive, is one of the keys to having a greater influence. 2. If I have a great attitude about teaching, I have a much better chance of forming good relationships with the kids and building trust. This is something that has come up over and over again in the research literature about dealing with kids in poverty. 3. I am here to teach, and the kids are here to learn. Engaging the kids in terrific lessons is one of the keys to their own achievement. 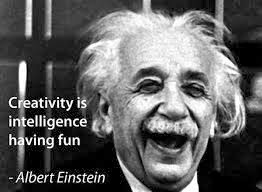 No matter how much fun we are having, the end result needs to be learning. There are many, many things I can do to help the kids learn better. Betty Britt Strange, art teacher: "Having taught in a Title one school for 25 years, I know that we have to meet basic needs of our students before they can settle down to the business of learning. I also know that we make far too many excuses for the behavior of ALL children. We cannot feel sorry for the children that come from less than ideal home situations because ultimately they have to be held accountable for their actions. If not, they'll never learn right from wrong. As an art teacher, I've traveled to many schools of different socio-economic backgrounds but have always been at my home based Title one school. The most direct factor on behavior that I see is how misbehavior is handled by teachers and administration. If you downplay or ignore it, it escalates. Behaviors are pretty much the same, the reasons for the behaviors are just different." "I think the student brings their own discipline challenges to the table and must take personal responsibility for their part of the problem. Taking responsibility for one's own choices is one of the hardest life lessons to communicate to students, but when they get it, it's powerful. No teacher can satisfy the needs of every child in her class. She can have great lessons, have great rapport, and children can make poor behavioral choices or lack motivation/effort. " Kim Brodie, elementary art teacher in Alabama, 20 yrs. experience. 1. 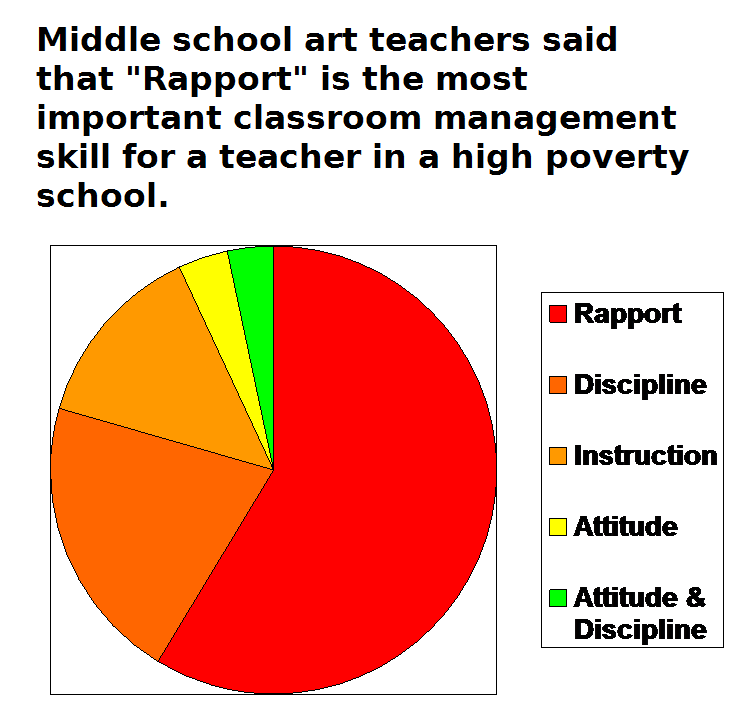 What is the best classroom management advice you have for a new art teacher? Kim Brodie, elementary: "Set your rules and procedures in place from day one. PRACTICE THEM for a week, which means physically acting them out so as to imprint these actions into your body. When rules/procedures are not followed, draw student attention to it and rehearse again and have consequences explained. Be consistent and be fair. Let the consequence be a logical consequence. Ex: break pencils, replace pencils. Talking too much, silence for next art class segregated from those they wish to talk to. Try not to be "stiff necked" or "hard line" but rather, appeal to student's feelings of what is "the right thing to do." I inject humor whenever possible. I talk to my students about what adults do and how I am helping to prepare them to be an adult. "You don't see me climbing in chairs, so I have you sit on your bottom so you will be safe." Arlene Johnson, middle school: "Never let the students know that they are frustrating you and always stick to any consequences you have given them for their behavior." Susan Pearson, high school: "Effective/quality lesson plans that have a variety of instructions that take up the block period." 2. What do you do to manage your groups effectively? Kim Brodie, elementary: "One of the more difficult tasks I have is to pick up and drop off classes to PE, which means walking them down the hall. When coming from PE, kids are wound up, have had difficulties/problems in PE that they are still emotional about. At our school, we have a schoolwide color chart. Each color represents whole class behavior choices. This REALLY helps as there is consistency throughout the school. When walking with a class, I hold a small color chart and move the clip according to their class behavior. I reward classes every nine weeks with a behavior reward party (Playdoh or paint). During art class, I maintain an "involved" proximity to my working students. I have a rolling cart/desk that I place in the center of the tables so I can see everyone and monitor interactions." Arlene Johnson, middle school: "Always have your lessons ready and keep them engaged. Have something waiting for them should they finish early." Susan Pearson, high school: "Effective/Quality lesson plans which consist of: lecturing, reading, defining art terms, questions and answers, (written notes & class participation), studio time (drawing assignments-handouts along with still life drawings) grade evaluations on all art assignments for the day. It really keeps me busy!" 3. If you have large numbers of students who have a hard time staying engaged or being quiet at appropriate times, how do you handle it? Kim Brodie, elementary school: "If the large number of students are regular ed and are 'taking over' the art class, I shut the class down and talk to them as a group. 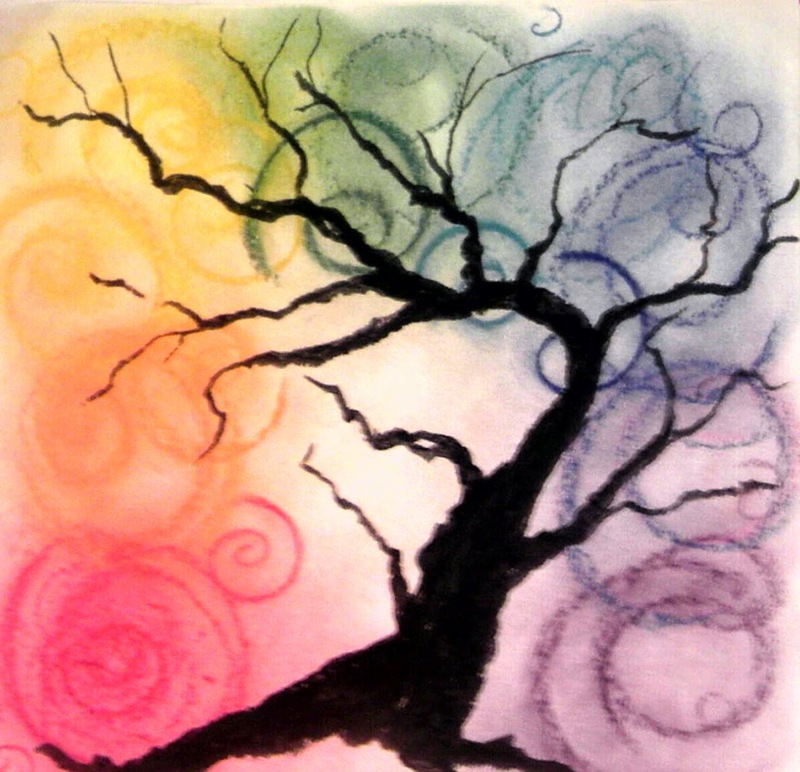 I talk about choices that are being made that disagree with the smooth running of our art class. I ask them if they really want to make that choice or if they'd like to try making a different choice. I talk about consequences for continuing to make a choice that is not appropriate for our art class. Noncompliance means- lights out, heads down, sitting, doing no art. If it is minor disturbance, I move students around to get talkers away from each other. I look for the ring leader and try to get them to make choices to be helpful rather than harming our class environment." Arlene Johnson, middle school: "Try to have any real disruptive students assist you in hanging up art or cleaning the art tools or the classroom. Give them something to do even if you make them the head of their table so they can manage the behaviors of their friends." Susan Pearson, high school: "Consistent, effective discipline. Day one -syllabus with information of the class course and disciplinary actions stating class infractions are violations of the Student Code of Conduct. Parental calls are made - if not then write ups on disciplinary reports." 4. How do you handle disrespectful students? Kim Brodie, elementary: "I call parents, I give sentences to write about why they're in school (second graders), I tell their teacher to move their behavior clip to a lower color, I write them up and principals give a consequence, I talk to them about why they are acting that way and do I treat them in that manner, I tell them to go to Time out." Arlene Johnson, middle school: "When students are disrespectful I talk with them about their behavior one on one, never in front of the whole class, take them outside the door, then warn them that you will speak with a parent, then call the parent and schedule a meeting. " Susan Pearson, high school: "Talk to student of the infraction, if no result then parental call if not, then a disciplinary report is submitted to the designated assistant principal." 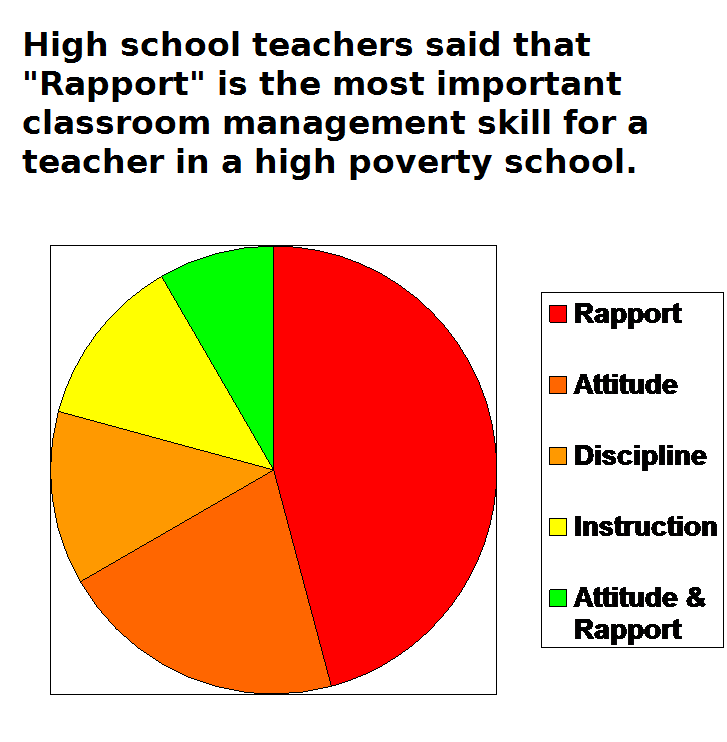 *20 elementary teachers in urban or Title I schools were surveyed for this article. "You are in charge of and responsible for what happens in your classroom. Your authority as the instructional leader of a classroom is not something you must seek out. Rather, it is something that is a fundamental component of a teacher’s role. Like it or not (and most teachers would probably say they have felt both emotions), you are the authority in your classroom, and you have to think strategically about how you use that authority. Without a doubt, you have the unquestionable right and responsibility to administer consequences and positive reinforcement that will encourage helpful behaviors and stop harmful ones." "Brown (2003) examined the culturally responsive classroom management strategies of a group of urban teachers who developed caring learning communities. Some of the things they did were to initiate and cultivate out-of- class conversations with students to get to know them personally; spend the first few weeks of school engaging students in social games and establishing school-to-home relationships." Classrooms With Revolving Doors: Recommended Practices for Middle Level and High School Teachers of At-Risk and Highly Mobile Students, College of William and Mary, Leslie W. Grant, Ph.D., Patricia A. Popp, Ph.D, James H. Strong, Ph.D.
view the academic needs and the affective needs of their students equally. Unless one need is met, the other cannot be met. view their relationships with students, particularly trusting relationships, as paramount to their success as teachers and to the success of their students. expect their students to perform well by having a “whatever it takes” mentality and by planning challenging instruction that focuses on making meaning rather than on memorizing facts. view ongoing student assessment as integral to the instruction process. use a variety of instructional activities within the classroom, actively engage students in the learning process, and use questioning to engage learners and as an integral part of their instructional strategies." "Never withhold recess from students for a disciplinary issue; there are countless other ways to let them know they behaved inappropriately. Children need physical education programs at every level to perform well academically. In addition, the use of games, movement, and drama will trigger the release of glucose, stored in the body as glycogen. Proper glucose levels are associated with stronger memory and cognitive function. In short, physical activity will reduce some of the issues associated with poor nutrition and will build student health. .......affirm effort every day in class. Most teachers don't keep track of their comments to students; maybe they should. When teachers give more positives than negatives (a 3:1 ratio is best), they optimize both learning and growth (Fredrickson & Losada, 2005). When affirmed, challenged, and encouraged, students work harder. ..........Focus on the core academic skills that students need the most. Begin with the basics, such as how to organize, study, take notes, prioritize, and remember key ideas. Then teach problem-solving, processing, and working-memory skills. ..........Address the real issue—distress—and the symptoms will diminish over time. Begin by building stronger relationships with students; this helps alleviate student stress. Reduce stress by embedding more classroom fun in academics. Provide temporary cognitive support—that is, help students get the extra glucose and oxygen they need—by having them engage in such sensory motor activities as the childhood game "head-toes-knees-shoulders," in which children touch different parts of their bodies in quick succession. Such actions can support behavioral regulation, which is so important for early academic success." "Highly effective instruction reduces, but does not eliminate, classroom behavior problems (Emmer & Stough, 2001)." "Considering the poor academic and social outcomes for students who are at risk, effective instruction becomes even more critical for this population. Although at- risk students enter the classroom with fewer academic skills and require increased instruction in order to accelerate learning (Donovan & Cross, 2002), they tend to receive far less instruction and praise than their peers who are not at risk (Wehby et al., 1998). ....Some students, for example, may require more opportunities for practice and review, lower reading- level texts, books on tape, or small-group instruction." Social class makes a difference in how children tackle classroom problems "Schools can step in to alleviate these differences in kids' willingness to seek help," Calarco said. "Teachers need to be aware of social class differences that students are bringing with them into the classroom. They need to be more active in seeking out struggling students, because if we leave it up to the kids, they may not seek it themselves." A Trauma Informed Approach to Behaviors in the Classroom, by Robyn Gobbel, LCSW, Central Texas Attachment and Trauma Center: "I am regularly asked for an article or some scholarly referenced material that parents can give to teachers that describes why a traditional behavioral management system (levels, colors, stop-light, clip charts, etc.) don’t work for kids who have experienced early trauma- in fact they often make behaviors worse." Listing of resources on how poverty can effect student behavior - many thanks to Steph Brooks for her suggestions! "As the screaming and the swearing escalated in the hall, the Metropolitan Business Academy principal, Judith Puglisi, was called. She approached the student. “What do you need?” she asked in an almost-whisper." "A schoolwide instructional approach to student discipline—in which prosocial behaviors are taught just as academic skills are taught—can have a powerful effect on school climate. Schools that have implemented schoolwide behavior support have seen reductions in office referrals and reduced suspensions by as much as 60 percent (Turnbull et al., 2002)." "A whole other big one that always rises to the top is student misbehavior and discipline. But there's an interesting thing in the data, which is that the amount of student behavior and discipline problems varies dramatically between schools. And poverty is by no means the only, or main factor. And some schools do a far better job of dealing with it, coping with it and addressing it than other schools. And those schools that do a better job of coping with it have significantly better teacher retention. We have this finding that schools can manage behavioral issues in good ways or bad ways."